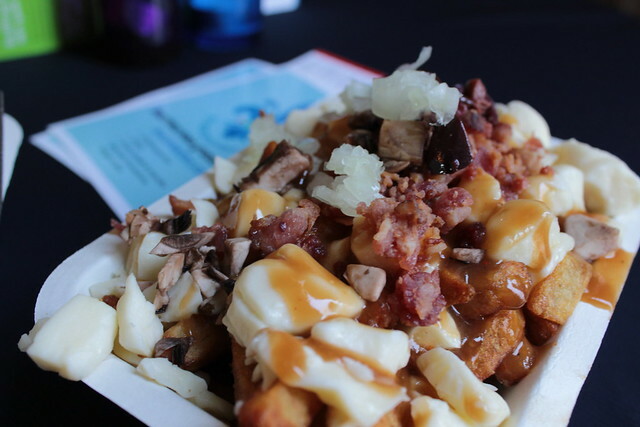 Festival de la Poutine 2.0 – I WILL EAT YOU! So, through a comedy of errors, I accidentally ended up with an extra ticket to the Festival de la Poutine last Saturday. Normally, not an issue, but with each ticket, you also get a free serving of poutine from La Belle Patate. Most normal people would shrug this off. Me, being an idiot, thought it was a good idea to try to eat both servings. Why would I do this to myself…? Like I said: I’m not very smart. The Festival, held at Heritage Hall on Main Street, is split into time periods: Day and Night. I was there for the daytime stretch, which was pretty low-key. Besides the serving from La Belle Patate, there wasn’t much else going on. Just many friendly staffers, a long line of poutine hungry festival goers, and a t-shirt/tattoo stand. The Night shift apparently has the live music and ‘alternative’ poutine tastings. This is all stated very clearly on all of the Festival’s literature, so I really don’t have any one to blame except myself.